Data Recovery Experts Gold Coast – All Is Not Lost! It can be a total disaster when data is corrupted or lost through viruses, hardware failure and more. 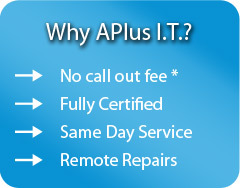 APLUS I.T Computer Services Data Recovery Services cover many factors of lost or corrupted data by Windows and hard drive boot problems. Hard Drive Data Recovery is a simple procedure (only time consuming) as long as the BIOS recognises it and the hard drive turns on – which is the case 80% of the time. For a diagnostic fee of $45 we can establish if your data is recoverable. In our experience, only in about 20% of the cases (when the hard drive has physical damage) is data impossible to recover. 24 hours is needed for most of the data recovery services; bring it in today, pick it up tomorrow. Unable To Access Microsoft Office Files? A most common problem of data loss that individuals and businesses alike have experienced is the situation where you are not able to access data in Microsoft Office applications (Word, Excel, Power Point, Outlook). If your hard drive is broken or corrupted, all is not lost. In many cases we can recover your important files. In most of the cases we can Recover and Restore your files within 24 hours or less. Here are the requirements for data recovery to be a possibility. Simply contact our friendly team and we’ll take great care of you and help you establish whether your data can be saved!